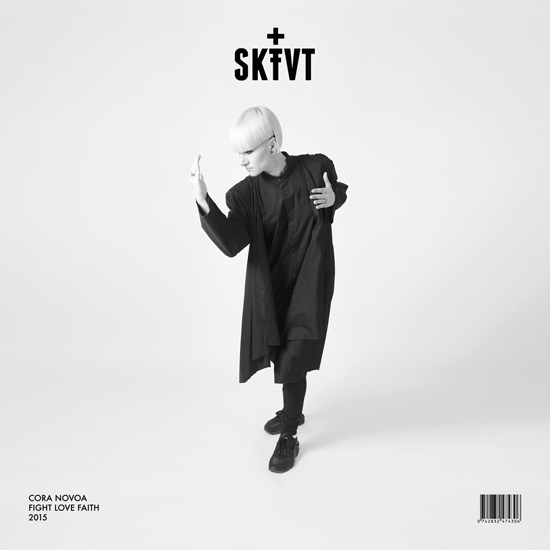 Charismatic and always restless artist Cora Novoa presents her latest LP Fight Love Faith: a new album swinging between different styles such as electronic, indie and experimental pop, which keeps a distance with the sound she is used to. The LP, which will be released on September 2015, is an emphatic turning point that will definetively surprise at large both industry and her followers. During these four years since her last album, the Galician artist has deeply dived into a thorough documentation among the complexity of mithology and occult sciences, disciplines that have directly influenced the narrative, composition and creation of this new LP. Cora Novoa has been experimenting, locked up in her studio, with unexpected sounds in order to shape and create this new release, which shows a closer essence to soul, broken beat rythms, detailed melodies and far from mainstream vocals. Black music with a techno heart. Fight Love Faith brings us the new age and most synthpop sound of Novoa. Tracks shaped using Roland machines and synthesizers sequences that will take us directly back to the early 80’s. With this new album the artist shows, shock wave like, melodies, splashed with psychedelia, and deeply influenced by the most underground electronic sound. In addition to the standard version, this new release will also be available in a smoky grey plexiglass limited edition packaging, that compels to join, therefore, the musical experience with a high end graphic and product design. Both formats deliberately deconstruct the mainstream concept of cover and back cover, giving the audience, in a subtle though daring way, the change to decide where to start and which face we chose for our own Fight Love Faith experience. This album is far from standard parameters, but strongly loaded with symbolism and occultist references and meanings, all of which have been precisely stitched along the whole narrative, with no loose ends. A sincere declaration of intent that invites us to unravel the true meaning of Fight Love Faith.